Kitchens are like the heart of our homes. Sometimes, it may seem as if our kitchen is not big enough to accommodate all the items and appliances that are essential for cooking. But, with proper utilization of the space and some nice kitchen storage ideas, anyone can have the kitchen of their dreams, no matter how small it is. Have a look at 7 useful kitchen storage solutions that you can implement with limited budget, time and resources. A backboard occupies the under-used wall-space and free-up some space in your cabinets and drawers. It comes outfitted with books, and is perfect for hanging those small pots, pans and utensils. You can hang it near you prep space, so you will have all the tools at your fingertips. A well-hinged corner-cabinet can hold your kitchen appliances as well as the baking supplies. Such a unit can eliminate the need of digging through the stored items to reach the back-end of the cabinet. A pot rack will free up the cabinet space and also put your cookware within easy reach. It hangs around from the ceiling with the help of chains attached to multiple hooks that are welded firmly to the grate. 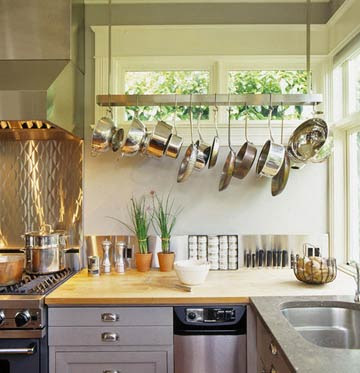 Your pans and utensils are suspended from this great using metal S hooks. 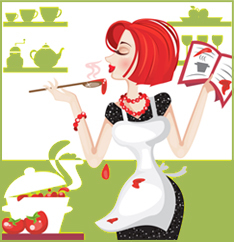 You can find a great tutorial on DIY kitchen pot racks here. You can get an armoire with deep drawers, and store linens, baking sheets, dish towels. They usually have an upper cabinet with transparent glass door, which is great to store and show off your pretty dishes. Did you overlook the extra space available above the kitchen’s doorway? Well, you can hang a shelf over there and store those pretty china pieces and other utensils that you use occasionally. By pairing accessibility and storage functionality, pull-out shelves keep your appliances hidden from sight, but you can roll them out easily whenever you want. Along with that, a hidden roll out cart is a nice way to store your items, while also being easy to use for various purposes and to carry around with you in the kitchen. If storage space in your kitchen is a serious limitation, and you are unable to get that extra room that you are looking for – you should go for renting a storage unit (like this one in Auckland). It’s a nice idea when you don’t want to spend a lot of time and effort in trying to re-arrange your kitchen by trying out various storage space ideas. In fact, it’s also the perfect solution when you have to renovate your kitchen for better utilization of space, and want to save your kitchen appliances and utensils from damage. While making use of one or more of the above ideas for properly utilizing your kitchen space, you will not just free up some extra space but also arrange everything in a nice way for easy accessibility. Once you’ve done that, you can use the freed up space for storing your new kitchen appliances, the ones you have been waiting to buy. Now, just get started with some of the above ideas and build the kitchen of your dreams.